Hebe brockiei is a much-branched, low-growing, evergreen shrub, reaching 8 in (20 cm) or more tall. The leaves are oval, mid-green, and markedly concave, about 0.5 in (12 mm) long. 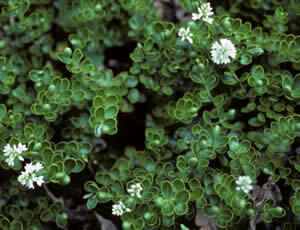 Crowded spikes of white flowers are borne in May and June. Hardy, but rarely available in the UK. It was found in grassland at the head of the Doubtful River, Canterbury, South Island, New Zealand, and was named after Walter Brockie, curator of the Otari Native Plant Museum, Wellington, New Zealand. Now regarded as a form of Hebe treadwellii.